Larks, Starlings, and Red Wing Blackbirds. I am preparing for my upcoming show at the Museum of natural history with Keith. My idea for the show is to do some paintings of my favorite birds. I am painting them fairly realistically. Their environments are more abstracted, allowing me to play with colors, mark making, and pattern. 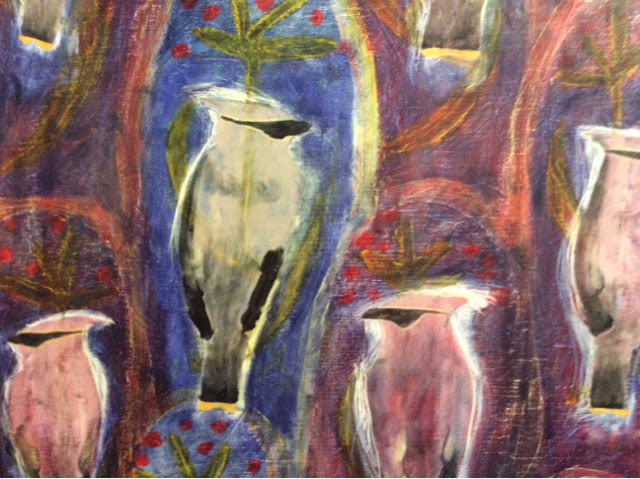 The background in the piece above is painted in oils, I will paint the bird in encaustic, as soon as I figure out which bird to put. 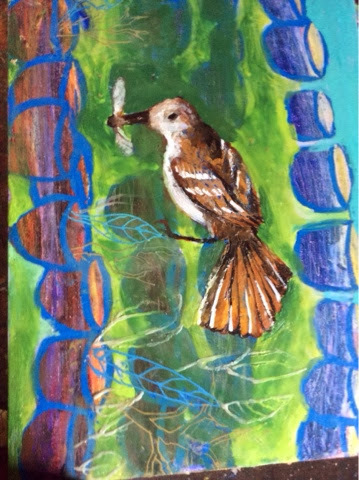 I am still working on this flycatcher- the first few layers are oil and now I'm painting the rest in encaustic. The cedar waxwing has such a striking look I was inspired to make it into a repeat pattern. This was all done in oils, and will add finishing details in encaustic. 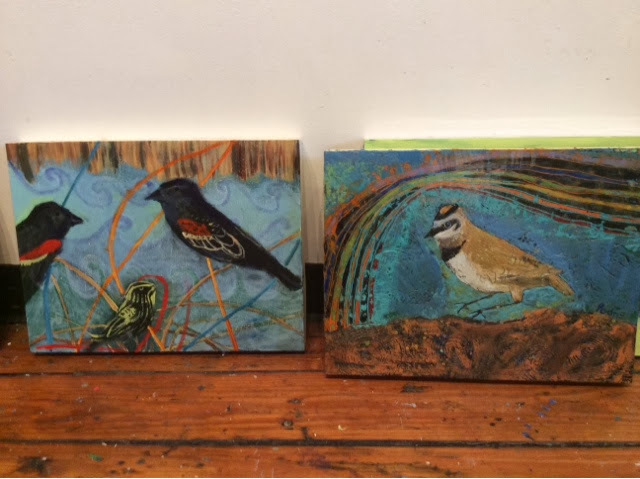 Working on a red wing blackbird family and a horned lark. These are starlings. This one is done. 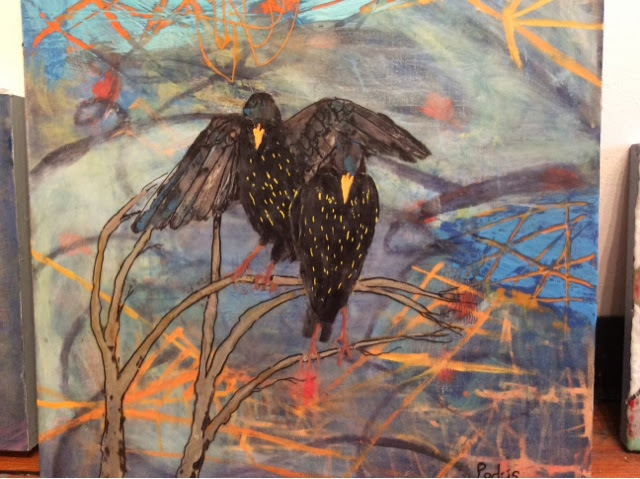 Almost all the background is oils, and the birds and tree are encaustic. 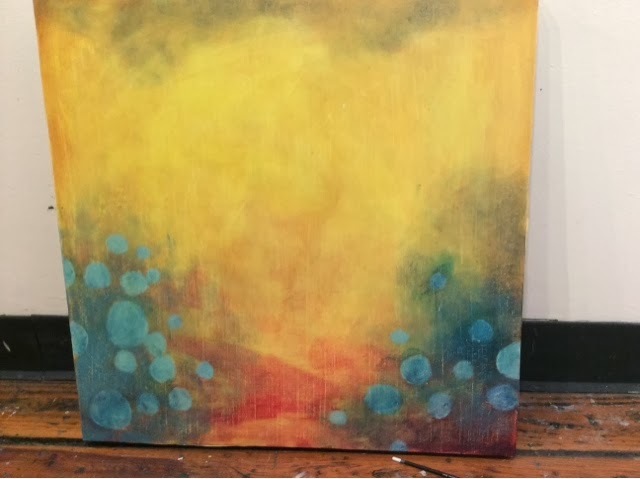 This painting has a lot of layers, and a depth that is hard to capture in a photo. This body of work has been a great culmination of many interests for me. Combining oils and encaustics has been really fun, and creating these energetic spaces for the birds to live. The show will open in March.